... just look at the moodiness of Red Umbrella! Laura conveys emotion via the most elementary supplies - magazines gathered from recycling bins and discarded library books, glue stick, and occasionally scissors. "Every collage starts with an assortment of reference images, a basic sketch and a general idea of colors. From there, since I never know what magazines I’m going to have as my palette, so I figure out color placement and detail in real time." Of course I'm personally attracted to this sweet face, as Buddy could be Otto's brother. 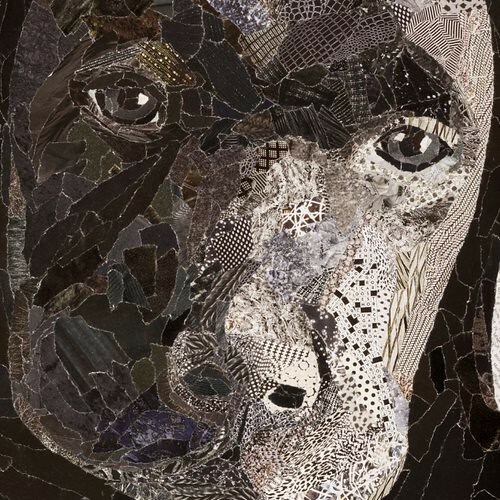 Laura upcycled magazines and pages from James Thurber’s Dog Stories for the background. The pieces she tore and layered are quite small, while the 24 x 24-inch size of this collage, her most recent, is impressive. 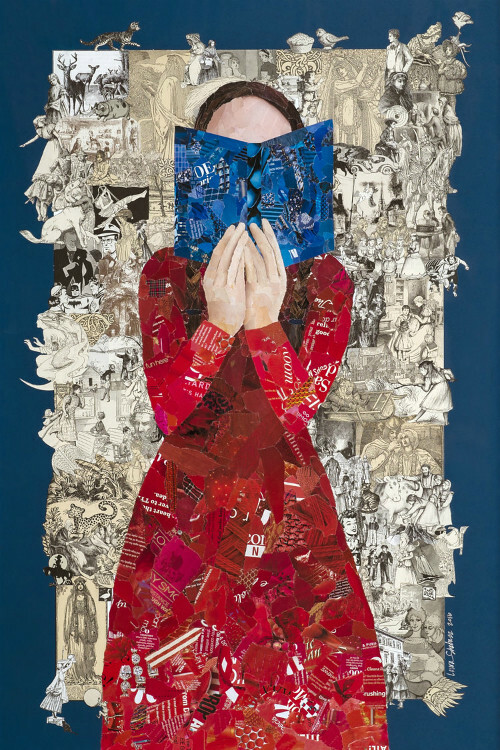 Worlds of Imagination (below) combines upcycled book and magazine pages and is even larger, 24 x 36 inches. 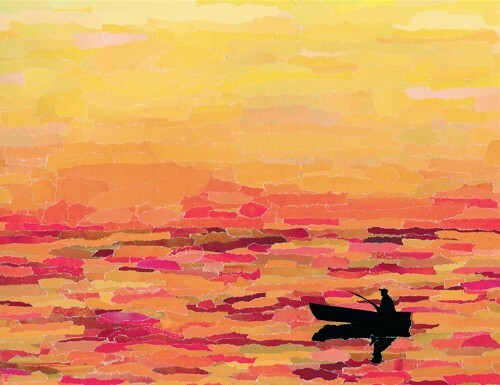 While many of her collages feature a face or figure, this serene fishing scene is mesmerizing, and the warm color palette captures the joy of solitary fishing. 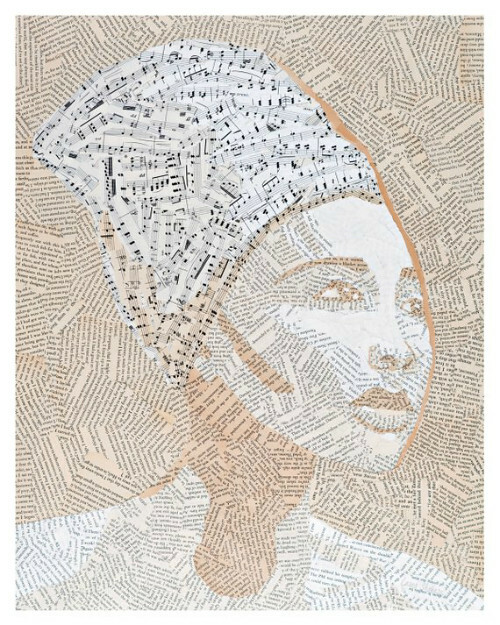 Rhapsody in Monochrome is an 18 x 24-inch collage of upcycled book pages and music. Natural yellowing of the paper provides the colors. 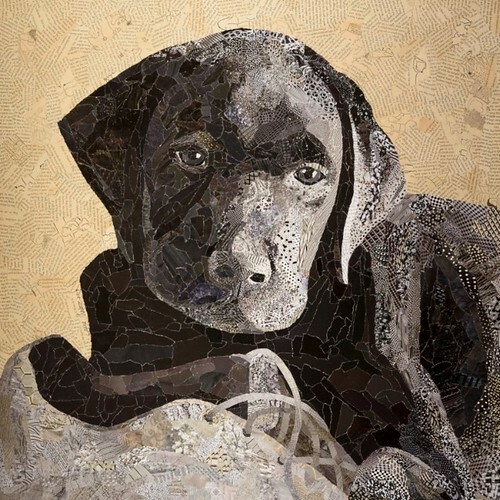 Currently, Laura's collages can be seen in a group show at Atrium Gallery in Morristown, New Jersey, and at the Hidden Gallery, located in Just Cabinetry in Bernardsville, New Jersey. She will be participating in an open studio arts sale in Bernardsville and Basking Ridge, New Jersey in September. 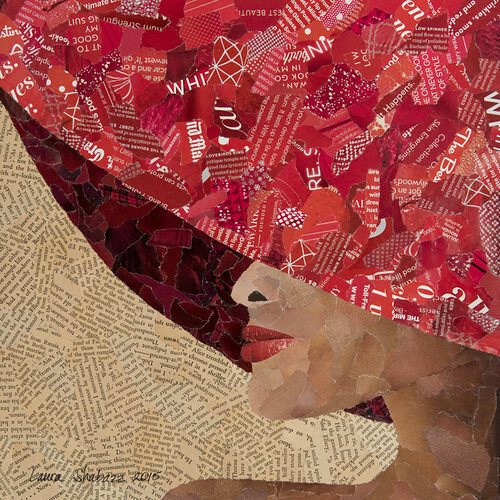 Follow @laurashabazz on Instagram and visit Laura Shabazz to view more collages and to sign up for her mailing list. 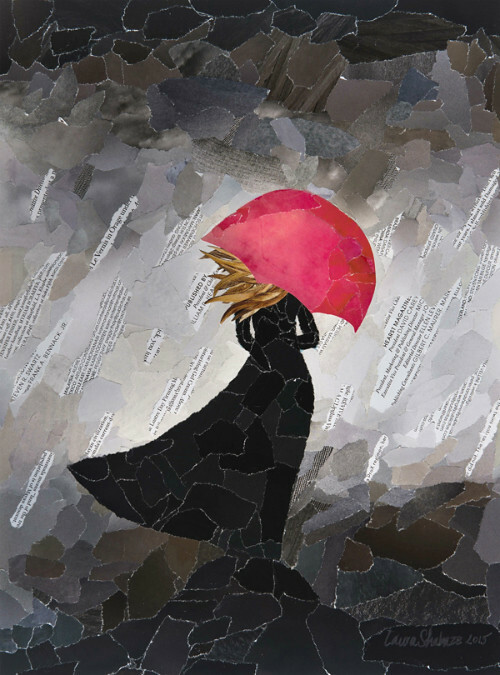 She accepts orders for custom collages based on a photograph. My goodness - that is some awesome talent!!! The talent of some people is astounding! Beautiful! Oh, I do love these!